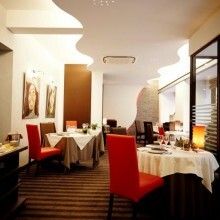 The restaurant created in 1991 by the chef Antoine Souillat has been completly renovated with a new modern decoration. La Table d’Antoine reopened in june 2014 after works of embellishment and enlargement, with : a new space of 150 M2 12 M of windows in the walking street a visible glazed wine cellar since the dining room with 3 000 bottles of french wines a cooking at the same level The restaurant is recommended by numerous travel and gastronomic guides. It is member of the « Maître-Restaurateur », quality label awarded by the french government.